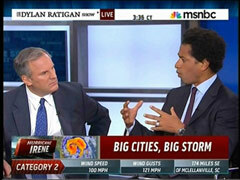 On Friday's Dylan Ratigan Show, MSNBC contributor Touré, who is also a 9/11 truther, wondered if Hurricane Irene is an example of global warming. He speculated, "When you talk about an unusual weather event happening in New York and this sort of thing, is this really evidence of global warming to see this sort of a massive storm happening here?" Go here for screen shots of the Tweets. Stephen Flynn of The Center for National Policy seemed to agree with linking Hurricane Irene to climate change. He asserted, "I think the evidence is a bit overwhelming that we're seeing climate change, which is generating more significant events, in terms of frequency and scale." It's a bit much to blame this hurricane on global warming. It's even weirder when a conspiracy-minded 9/11 truther does it. TOURE: When you talk about an unusual weather event happening in New York and this sort of thing, is this really evidence of global warming to see this sort of a massive storm happening here? TOURE: Yeah. We're going to see more of these as time goes on? FLYNN: Absolutely. With higher intensity. And then, the other issue, we we live and how. We're concentrated. A long time ago, cast about. And, so, being prepared is key. And recognizing, where you're vulnerable, what you're dependent on in building a plan.